The Stendhal syndrome! To Apostatize or not ? Just arriving from Rome and Florence with a group of young American students from California. 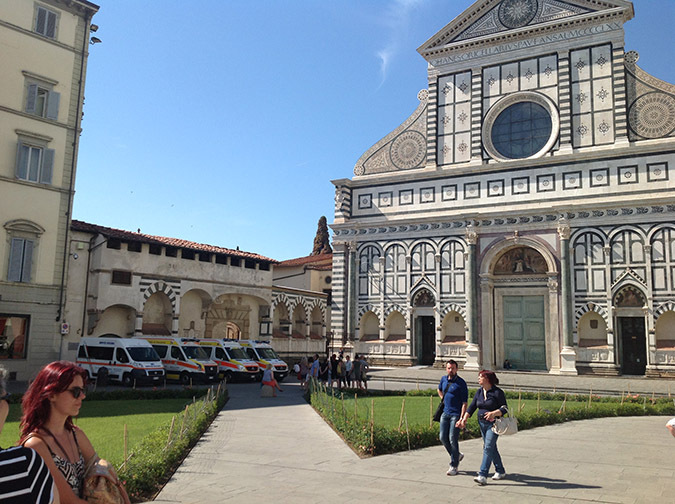 After our visits to the Uffizi, Santa Croce and Santa Maria Novella, did anyone faint? No! Did anyone have tachycardia? No! Any confusion? No! In brief no one suffered from the notorious Stendhal syndrome. But what is the Stendhal syndrome? As Wikipedia mentioned, it “is a psychosomatic disorder that causes rapid heartbeat, dizziness, fainting, confusion and even hallucinations when an individual is exposed to an experience of great personal significance, particularly viewing art. The term can also be used to describe a similar reaction when confronted with immense beauty in the natural world”. In the 19th century, doing the Grand Tour of Europe, many British women (and few men) would faint in the Tribuna of the Uffizi or on Piazza della Signoria in Florence, in front of its loggia filled with statues from the Renaissance and the Antiquity. For them, it was too much, too many beautiful things to be cognitively absorbed at once. But in fact, it was their long thick Victorian black dresses worn in temperatures above 30 degrees (Celcius) that made them faint. Since we asked our participants to wear light comfortable cloth and we made sure that they were always hydrated, the ambulance remained well parked in front of Santa Maria Novella. But on a more personal side, on the streets of Rome, visiting its very first churches such as San Agnese, Santa Costanza and San Gregorio, I have to admit that, Christian as I am in the conundrum of the current international situation, I really felt that I could not apostatize. Christ the philosopher whom I saw so many times humbly painted in these churches seemed as important as Plato and Aristotle featured at the Vatican Museum. Did I faint? No! But I felt something. Maybe that was my personal Stendhal syndrome that I am sharing with you.